Car Transport Depot has the knowledge and tools to ship many types of vehicles. We serve all 50 states. So what would you like to get shipped? CTD can help you with Car Shipping nationwide. We will pick up your car and deliver it anywhere in the US. 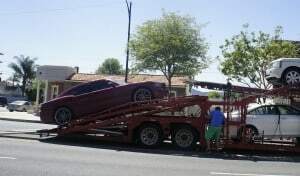 CTD can also ship cars to or from auctions and dealerships. We will also be happy to help dealers with Car Delivery! You can choose Open or Enclosed transport for your auto. With Open Car Transport, your car is loaded onto an open car carrier, along with other vehicles. You might have seen car carriers transporting several vehicles on the road like this. With Enclosed Car Transport, your car will receive a higher level of protection. Enclosed Transport is often chosen for Classic Cars. Need to ship your bus or limo? Buses and limos are expensive and heavy vehicles. They need a lot of space on the truck. Our car movers have trucks that are big enough and right for this kind of Auto Shipping. Our staff knows how to handle Bus and Limo Shipping. Not everyone can ride a motorbike across the entire continent. No wonder so many people use Motorcycle Shipping services. We will deliver your motorcycle safe and sound anywhere you need it. This type of Vehicle Transport is easy and affordable. If you have ever tried to move your boat yourself, you know it’s not easy. But CTD knows how to make Boat Shipping simple for you. We can ship your boat to any American city in a timely fashion. We are affordable and care a lot about the quality of our services. CTD can handle your Van Transport too. We can transport any type of van, from sprinter vans to cargo vans to passenger vans. If you need to move a van across the country, CTD is the company to call. We can handle any type of Trailer Transport. This includes trailer homes. If you are moving your trailer or relocating your trailer home, CTD can help. CTD can help you with Truck Transport, whether you’re moving just one truck or several. We can transport all kinds of trucks, including food trucks, semi trucks, and more. CTD can handle any kind of Vehicle Transport. We are looking forward to shipping for you!